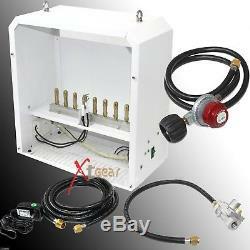 New Hydroponic CO2 Natural Gas Generator 8 Burners Safety Auto Piloting Grow. Hydroponic CO2 Natural Gas Generator 8 Burners Safety Auto Piloting Grow Burners. The easiest way to accelerate plant growth. Carbon dioxide is one of the essential ingredients in green plant growth. This CO2 Generator provides the carbon dioxide to meet maximum growing potential, and operates for only pennies a day. CO2 generators feature powder-coated steel enclosures that resist moisture, rust and discoloration - providing years of trouble-free operation. Buil in two-stage safety pilot valve does not allow fuel to flow to the burner unless the pilot is lit, and will shut down the fuel supply in the event the unit falls or tips over. The solid state electronic ignition module creates a spark to light the burners. CO2 generators are available in both propane and natural gas models. Dual solenoid valves Precision manufactured brass burners Solid state electronic ignition module - no pilot light necessary TIP OVER switch shuts off gas source if the unit falls or tips over SHUT DOWN warning with LED error indicator light Fabricated with all high quality components Easy to operate COMPONENTS 8 pre-mounted brass burners Dual solenoid valves hose and pressure regulator Hanging hardware kit 110V power supply SPECIFICATIONS 1.5 Amps/120 Volts/60 Hz Provides 22 cubic feet per hr of CO2 For spaces larger than 14' x 14. Variable CO2 output from 16 to 26 cubic foot CO2 / Hr. Solid state electronic ignition control module eliminates the open pilot flame. Unit comes standard with 8 brass burners pre-installed. The burners are designed to burn clean and produce consistent blue flames. Solenoid valves add a second layer of safety. 16-1/2" x 8-1/2" x 16-1/2. Comes complete hose & pressure regulator for Natural Gas. Natural Gas hoses aprox 10ft and a lead hose 2ft + regulator. Please make sure you order the correct item as orders cannot be altered after the order is paid for. The flat rates quoted in the table will apply to most destinations in the countries/states listed. Occasionally (usually, but not always in remote/rural areas), some addresses will not qualify for the service or rates that are quoted. We reserve the right to cancel an order or terminate a sale for any reason. Customers must return all items in their original condition which include the original Packaging accompanied with packing slip, Documentation & Manuals and Accessories, etc. We welcome and treasure all of our customers. The item "New Hydroponic CO2 Natural Gas Generator 8 Burners Safety Auto Piloting Grow" is in sale since Tuesday, August 19, 2014. This item is in the category "Home & Garden\Yard, Garden & Outdoor Living\Gardening Supplies\Hydroponics & Seed Starting\Hydroponic Systems".